Enzol Holdings Ltd - organic and non-organic speciality seeds and natural products. Seed multiplication, drying, milling and sterilisation specialists. Grown in BIO-GRO certified orchards in the Canterbury and Otago regions of New Zealand, organic apples are pulped into a concentrate using a counter-current extraction method. The concentrate is a result of high quality mixed variety apples. Ideal as a sugar substitute for the health conscious or as a base for juice blends. Concentrate is available in 200 litre drums with a brix level range between 71 and 72. Using a BIO-GRO certified organic apple concentrate, grown and processed in the South Island of New Zealand, ‘Appley, the first carbonated organic apple juice in Australasia, is now available. 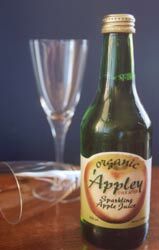 ‘Appley has a crisp clean taste, with just the right amount of carbonation. It is ideal as an alternative to an alcoholic beverage while being fully certified by BIO-GRO and GE Free. Currently available in 350ml bottles (1 carton = 24 bottles).